Pod Charity funds school lunches in Nepal and our Charity Manager Sarah finds out how this is impacting on the pupils and wider issue surrounding essential food. We all need food to survive; this is a basic and irrefutable statement. However the way that food is viewed changes from country to country, even from community to community. In the West, most of us, although sadly not all, are lucky enough to be able to view food as something to be enjoyed. We are confident in the idea that we will have enough to eat, and so we have the luxury to view food as something to be relished and savoured. In the country where I am living, Nepal, this is rarely true. Food is for sustenance and life giving. The attitude is based on practicalities; we must live to eat. The majority of Nepali’s will have two meals a day and for most, both of these meals will be the national dish dal bhat. Dal bhat, is a highly nutritious and practical meal that can be produced relatively cheaply; it consists of rice, dal (lentil curry) and a vegetable curry, the lucky few will occasionally have some meat. Unfortunately, some Nepali’s do not have enough money to have these two meals a day; the UN decreed that in 2005 54.7% of the population were living below $1.25 a day, the international poverty indicator. Throughout this time period, Nepal, and other countries over the world have been working toward the Millenium Development Goal to halve this poverty rate by 2015; Nepal is no where near this target, with still almost 50% of the population living on less than $1.25 a day. There are families here who are struggling to keep themselves alive; parents who will go without food to give their children the most basic of meals. In this community, it is common for families live on the streets or in shacks constructed from tarpaulin and metal sheeting if they are lucky. Young children are raised without basic amenities. When life is a daily struggle and a battle to stay alive, priorities quickly change; getting through each day is a triumph. For these families, the aim is to move out of poverty and to improve their children’s and future generation’s quality of life; education is their route. The Nepali Government has, through research, determined that ‘Poverty is substantially lower (in families with) higher levels of education’ (Central Bureau of Statistics). Through education, children can grow and learn skills that will equip them for the future and will, hopefully, secure them employment and a route out of poverty. But how are they supposed to do this without food in their belly? For children to concentrate at school they need energy, they get energy from the food they consume; so to ask them to work hard and concentrate without having given them a good meal, is like trying to start a car with no petrol in it. This is clearly a global problem, however we can help. Pod works here in several local, government schools with our volunteers teaching as well as providing vital training to the staff. These schools are all underfunded and understaffed and are struggling; our aim is to enable the children at all these schools to reach their full potential. The children at these schools are bright and eager to learn, but they are already at a disadvantage - they are hungry. 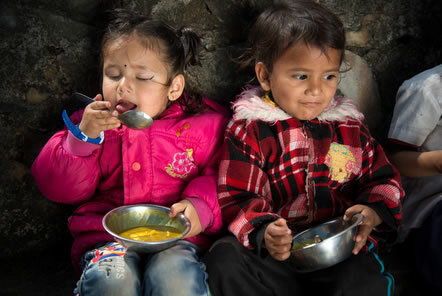 In an effort to tackle this and to encourage these children to progress and learn, the Pod Charity has been donating money to the schools to pay for each of the children to have a healthy, nutritious lunchtime meal often of dal bhat or noodles. I have been fortunate to visit these placements and monitor over time the impact this is having; it is clear that it is huge positive one. The teachers are reporting to me, that the children are able to concentrate now and complete their learning. They are enthusiastic, willing and eager to learn and this has been lovely to witness and be a part of. These lunch donations has also had some other positive impacts which I certainly did not envisage. Tika, one of the wonderful and committed teachers at a local primary school, reported to me on my last visit that the children’s attendance is improving hugely. In her class alone, the number of students who are regularly attending has increased by a third; I asked her why she feels this is happening and she told me that parents now feel that the family will gain more benefit from the children attending school in comparison to them staying home and helping with the chores and work. As well as their attendance and concentration improving, I feel that I can see a marked difference in the behaviour of the children. The children seem to have energy and to be playful, but there a fewer fights and arguments; the children are understanding the benefit of school and the need to work harder and they are not taking this opportunity for granted. It has been a priviledge for myself personally, and for the Pod Charity to see the many positive impacts that can be gained through something so simple as providing a meal. A main meal a day, benefits a student by giving them the energy to remain alert and focused during lesson time; I have personally been lucky to see the real truth in this sentence. The children whom are benefitting from the Pod Charity’s work, will hopefully continue into the future to reach their full potential; our hope, as an organisation, is that they will be able to break the cycle or extreme poverty and continue to improve the quality of life for their children.